Download these scrapbooking video tutorials and create delightful projects for Valentines Day, or just to celebrate romance or love in all its wonderful forms. This beautiful card is a wonderful gift for someone special on Valentine's Day or at any time "just because"! It's made with the Hearts and Strips medallion stamp from Holly Berry House # 1526 M.
This is a project for crafters who enjoy heat embossing, precision paper trimming and using glitter. If you've never done heat embossing before, I direct you to my free video tutorial, How to Do Heat Embossing. These medallion cards are truly stunning -- well worth the amount of work you put into them. If you've never made one before, they can be challenging to figure out on your own. 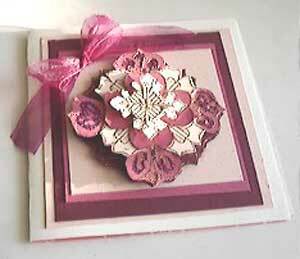 I took a class at a local stamp store to learn how to work with the Holly Berry House medallions. The video tutorial and the accompanying PDF file will show you all you need to know to begin creating these medallion cards yourself. Remember! You DOWNLOAD your video from the Web. Nothing arrives by mail. Watch this space for more videos coming soon, or sign up to my email newsletterto be notified when they're available. Why Not Just Go to a Workshop? Availability: Perhaps your area doesn't offer many classes or workshops. Not everyone lives in a city with multiple scrapbook or crafting stores at their disposal. Schedule: Perhaps the workshops don't fit your busy schedule. Maybe the ones you want are scheduled for a day and time when you can't make it. Or maybe the class involves a long drive after dark, and you'd just rather not. Time Constraints: Maybe you're just too busy to get to a class. After all, your work commitments and your family responsibilities come first. Interest: Sometimes the workshops and classes don't offer the projects that you want to make. Supplies: Maybe the projects call for special tools or supplies that you don't want to buy or can't locate. Class Speed: Perhaps the classes move too quickly or too slowly for you. You prefer to work at your own speed and take breaks when you want to. Complexity: Sometimes you make a complex project in a class, then you can't remember how to replicate it again at home. Instructor Style: Occasionally, the instructor's style or personality just doesn't fit for you. Perhaps she provides complicated instructions that you find challenging to follow or she has no time to offer personal assistance. Or perhaps you are seated too far away from the instructor and have problems seeing what he or she is doing. Speed: You download these videos immediately. No waiting for a class. Download them from the Net and start gathering up your supplies within minutes. Convenience: You watch these video tutorials at your leisure, when you want and as often as you want. You work at your own pace. Pause the video when you want; start it playing again when you're ready. Visibility: Since you have a bird's eye view of the video, you see exactly what I'm doing. No craning your neck or giving up in frustration because you're sitting too far away. Generic Supplies: The supplies and tools are readily available. Although I may recommend or use a certain brand or tool, I always offer alternative suggestions. I'm interested in saving you money, so whenever possible, I offer work arounds or show you money saving tips. Cost: Affordably priced at less than you pay for a latte, you receive video tutorials for each product purchased. Afraid you'll miss the companionship of other crafters? Why not host a crafting party and invite a few friends in for a "scrapping bee?" You will download a downloadable video for each product purchased, plus you will receive a supply list outlining the supplies you will need for each project. How do I Get the Videos? After you make your purchase, you will be directed to a download page where you download the videos and store them on your computer. Please note that I do not send you a CD in the mail. You download your videos instantly after making the transaction -- no waiting! And no costly shipping and handling fees, either! These videos are compressed into a zip file. You will need a software utility such as Winzip to open the files. If you do not already have a suitable program, you can downloadWinzipfor a 30 day free trial or you can get free decompression software atthis link. The video files are in Quicktime format. You play them with the freeQuicktime Playermade by Apple. This product has a 100% money back guarantee for a period of sixty days. Can I Make These Projects if I'm a Beginner to Scrapbooking? Why are they Called Diamond? Because I plan on making a series of scrapbooking video tutorials, and each will be named for a different gemstone. Sapphire was the first video; Diamond is the second in the series. You may make copies of these videos for your personal use, but I ask for and appreciate your cooperation by not distributing copies to friends and other people.